By Keith Cowing on December 31, 2010 11:03 PM. "The information provided below supplements prior postings at the official procurement web site in specific areas of high interest to potential bidders. Any additional questions related to this supplemental information should be directed to the procurement website for formal written response." Continue reading ISS National Lab CAN: NASA's Murky Clarification. By Keith Cowing on December 31, 2010 7:33 PM. "Thanks to congressional inaction, NASA must continue to fund its defunct Ares I rocket program until March -- a requirement that will cost the agency nearly $500 million at a time when NASA is struggling with the expensive task of replacing the space shuttle. About one-third that money -- $165 million -- will go to Alliant Techsystems, or ATK, which has a $2 billion contract to build the solid-rocket first stage for the Ares I, the rocket that was supposed to fill the shuttle's role of transporting astronauts to the International Space Station. But under a new NASA plan signed into law by President Barack Obama in October, there's no guarantee that the new rocket required by that plan will use solid-fuel propulsion. And, in fact, many in the agency say a liquid-fueled rocket would be cheaper, more powerful -- and safer." "Stifled by legislative bottlenecks, NASA will be forced to continue an already defunct rocket program until March, costing the agency half a billion dollars while adding more hurdles to the imminent task of replacing the space shuttle." "The language was placed into the 2010 budget by Sen. Richard Shelby, R-Ala., and keeps the whole Constellation program going until March 4, at a cost of $1.2 billion." "In part, NASA Headquarters blames U.S. Sen. Richard Shelby, R-Tuscaloosa, with whom the White House fought all year over space policy. But Shelby's office says that there is no reason NASA can't move forward. "NASA is just making excuses and continuing to drag its feet, just as it has done for the past two years under the Obama administration," Shelby spokesman Jonathan Graffeo said Wednesday." By Keith Cowing on December 31, 2010 3:47 PM. "... I ask that you continue planning and preparations efforts to execute this mission in late June 2011 as currently planned. This includes maintaining the requisite workforce to safely conduct this mission and extending contracts if necessary. We must focus on STS-135 as a real mission as well as a Launch-On-Need capability for the STS-134. Without clarity in focus now we reduce the probability of safely executing this critical mission. The purpose of this memorandum is to provide clear direction for the teams. STS-135 is critical to health of the International Space Station." "It remains to be seen where the agency will find the $600 million it needs to mount one more shuttle mission to the International Space Station (ISS) beyond the two scheduled for February and April, and to accelerate development of the commercial cargo craft needed to ease the ISS resupply burden after the shuttle is grounded for good. "The continuing resolution by itself does not endanger the extra shuttle mission, because on an annualized basis, the continuing resolution provides enough funding to fly the mission," NASA stated in a canned response to the inevitable question." By Keith Cowing on December 31, 2010 10:16 AM. Can NASA change in order to survive?, Orlando Sentinel via LA Times. "In the world of government spaceflight, that's almost a rounding error. And the ability of SpaceX to do so much with so little money is raising serious questions about NASA. The agency that once stood for American technical wizardry is starting to lose its luster. Inside NASA, some employees have taken to wearing T-shirts emblazoned with the letters "WWED," which stands for "What Would Elon Do?" -- a reference to SpaceX founder and Chief Executive Elon Musk, the Internet tycoon who invested his own fortune in pursuit of his dream of sending humans into space." By Keith Cowing on December 31, 2010 8:51 AM. "Buzz Aldrin was the second person to set foot on the moon; now he's the first to sue Topps Inc. for putting a photograph of the historic moment on its "American Heroes" series of trading cards. The 80-year-old retired astronaut sued Topps on Monday in federal court in Los Angeles, contending that the trading card company had unjustly profited from his historic achievement by including a photograph of the Apollo 11 mission in a series of trading cards." "Topps attorney Michael Kahn told the Los Angeles Times that the firm has a First Amendment right to include a factual description of the Apollo 11 mission and it included an image of Aldrin in his lunar suit because he is "an American hero." "I don't know what direction Aldrin's case against Topps will ultimately take," [Robert Pearlman, editor of collectSPACE.com]. "While I appreciate Aldrin's rights -- as afforded by the law -- to protect his image, I cannot help but also think that this could dissuade Topps and other trading card companies from producing astronaut and space-themed products, which would be unfortunate. Dating back to the 1960s, space trading cards have been a great way to engage kids in learning about space history." Keith's note: Gee, shouldn't the American taxpayers - the ones who spent hundreds of millions of dollars on "his historic achievement" i.e. the Apollo 11 mission, get a cut too? After all they paid for the trip to and from the photo op. Neil Armstrong is in the photo too (reflected in Aldrin's visor) and took the photo. Shouldn't he get a cut too? This photo has been reproduced innumerable times since 1969 and has transcended its original photo status and become universally iconic. Indeed, I'd be willing to bet that most people think that this is a photo of Neil Armstrong - not Buzz Aldrin. Indeed, only when viewing the high resolution image (rarely used) can you see even see the hard-to-read name tag. Most people born a generation or more after the event, simply see this photo as being "the first man on the Moon". 2009 Topps Heritage box (American Heroes Edition), Amazon.com (note the cover image). By Keith Cowing on December 28, 2010 10:39 AM. "On 23 December, the power from the Galaxy 15 battery completely drained during its loss of earth lock and the Baseband Equipment (BBE) command unit reset, as it was designed to do. Shortly thereafter Galaxy 15 began accepting commands and Intelsat engineers began receiving telemetry in our Satellite Operations center. We have placed Galaxy 15 in safe mode, and at this time, we are pleased to report it no longer poses any threat of satellite interference to either neighboring satellites or customer services." By Keith Cowing on December 27, 2010 8:25 PM. "Snows are finally winding down in New England today, Dec. 27, as a powerful low pressure system brought blizzard conditions from northern New Jersey to Maine over Christmas weekend. The GOES-13 satellite captured an image of the low's center off the Massachusetts coast and saw the snowfall left behind." By Keith Cowing on December 27, 2010 6:00 PM. "Representatives from NASA were in Loveland on Wednesday, touring the old Hewlett-Packard/Agilent campus, where they are considering developing a technology park that could house 60 to 80 businesses and create 10,000 jobs, said Don Marostica, Loveland resident and the state's development director. ... Members of the association and representatives from Marostica's office came up with a plan to create a technology park that would house Colorado businesses and a branch of NASA and approached the space agency with the idea in the fall." Keith's note: The following request for a correction was sent on behalf of the Colorado Association for Manufacturing and Technology to the newspaper that was the source of this 24 December posting on NASA Watch. I am publishing it at the request of the CAMT. "Request for correction: Articles published by the Coloradoan / Loveland Connection on Dec. 23 and 27 ("NASA looking into Loveland" and "Region could reach new heights with NASA project") contained several inaccuracies. Continue reading A New "Branch" of NASA in Colorado? (Updated). By Marc Boucher on December 25, 2010 6:27 AM. "ISRO, the Indian Space Research Organization, saw its GSLV Mark 1 rocket begin to disintegrate about a minute after launch today. It was carrying the GSAT-5P telecommunications satellite. The launch was at 5:34 a.m. EST (10:34 GMT). The launch started off well but just a minute after launch the rocket appeared to begin veer off course before it disintegrated. The problem appears to have been with the first stage. Of the three launches India has attempted this year, two have failed." By Keith Cowing on December 23, 2010 10:49 AM. "The European Space Agency (ESA) was unable to win its member governments' approval of NASA's proposed five-year extension of operations of the international space station because of an unrelated dispute over financial support for Europe's Arianespace commercial launch services consortium, ESA and European government officials said. As a result, no decision approving the station's extension to 2020 will be made before a March meeting of ESA governments. ESA already is committed to supporting the station through 2015, though the details remain to be worked out." By Keith Cowing on December 22, 2010 12:42 PM. "Curious how a device designed to produce fuel and oxygen on Mars transformed into a source of clean energy right here on Earth? 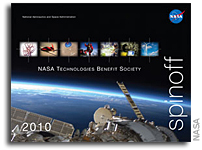 The 2010 edition of NASA's annual Spinoff publication is now available online, highlighting new innovations and notable examples of NASA technology improving everyday life on our home planet." By Keith Cowing on December 22, 2010 11:52 AM. "One of the biggest problems with NASA's implementation of the VSE was that they never understood why we were going to the Moon. I base this assertion on their own statements, actions and publications. Early workshops were held by the agency to develop a rationale for lunar return. The Exploration Directorate issued a poster showing six "themes" for lunar return, but no one at the agency could state their mission in one sentence. At a Congressional hearing in 2009, the acting administrator of NASA said the he did not understand what "return to the Moon" meant in terms of mission objectives and activities." By Keith Cowing on December 21, 2010 10:49 PM. "Under the CR, funding would continue at FY 2010 enacted levels for most programs." "Under the Senate deal set on Sunday, funding for most federal agencies and departments would continue at levels authorized for fiscal year 2010, though some programs would see slight increases. Overall, funding would be about $1.2 billion above the levels authorized in last year's budget. The House would also have to approve the spending measure." "Nelson also asked whether NASA plans to carry out an additional flight of the space shuttle next year as authorized in the new law. Robinson said the agency plans to conduct the additional flight to the International Space Station. "The only caveat I would put forth is we still don't have a final appropriations [act], so we don't know if we have the money to carry it out," she said. "We're trying to quantify what it means to hedge our bets in case there's a drastic change in funding level, but we have every intention of moving forward on that." Keith's note: NASA has to make a decision in January/February 2011 as to whether it can accomplish STS-135. Given the way that Congress is not cooperating with itself, having to live under this CR until March 2011 would make STS-135 somewhat problematical. Other problems such as Webb's mounting cost overrun are not going to make things any better. "Unlike the House bill, H.R. 3082, the Senate amendment does not weigh-in on NASA, which could mean the agency will be forced to operate in the coming months at spending rates proportional to the $18.72 appropriated for all of 2010. In addition, NASA would be prohibited from initiating new programs, and could be required to continue spending about $200 million per month on the Moon-bound Constellation program U.S. President Barack Obama sought to abandon in the $19 billion budget blueprint for 2011 that the White House sent lawmakers in February." Keith's update: This does not look good for STS-135. Nor does it bode well for trying to kick off any SOMD/ESMD merger and reprioritization/reorganization of programs since nothing can be killed and nothing can be started. By Keith Cowing on December 21, 2010 10:28 PM. "NASA is seeking proposals from researchers interested in testing new technologies during suborbital flights. The agency also is requesting information from commercial suborbital reusable launch vehicle providers and commercial payload integrators about carrying the technology payloads. The selected payloads will fly on aircraft that provide parabolic flight trajectories and on suborbital reusable launch vehicles capable of flying to altitudes above 62 miles. The flights will expose the payloads to reduced gravity and near-zero gravity environments." By Keith Cowing on December 21, 2010 10:27 PM. "Today, the House of Representatives concurred with the Senate Amendment to H.R. 5116, America COMPETES Reauthorization Act of 2010 by a bipartisan vote of 228 to 130. The bill aims to maintain our national economic and scientific leadership by: supporting basic research; improving science, technology, engineering, and math (STEM) education; and fostering innovation, especially the development of new energy technologies." By Keith Cowing on December 21, 2010 4:16 PM. "In a Dec. 20 memo to agency employees, the heads of NASA's Exploration Systems and Space Operations mission directorates said they had been tasked by NASA Administrator Charles Bolden to formulate a plan for combining the two organizations and report back to the agency chief in early 2011. "With the upcoming retirement of the Space Shuttle and the likely transition away from the Constellation Program, planning is underway that could lead to NASA's Space Operations and Exploration Systems Mission Directorates merging to create a new directorate to manage the integrated human spaceflight portfolio for the Agency," wrote Bill Gerstenmaier and Doug Cooke, associate administrators for NASA's Exploration Systems Mission Directorate and Space Operations Mission Directorate, respectively." By Keith Cowing on December 21, 2010 9:23 AM. "A total lunar eclipse is seen as the full moon is shadowed by the Earth on the arrival of the winter solstice, Tuesday, December 21, 2010 in Arlington, VA. The eclipse lasted about three hours and twenty-eight minutes. 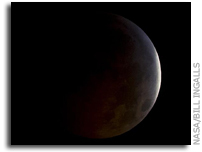 A lunar eclipse occurs when the Earth lines up directly between the sun and the moon, blocking the sun's rays and casting a shadow on the moon. As the moon moves deeper and deeper into the Earth's shadow, the moon changes color before your very eyes, turning from gray to an orange or deep shade of red." By Keith Cowing on December 20, 2010 1:06 PM. "NASA in 2010 set a new course for human spaceflight, helped rewrite science textbooks, redefined our understanding of Earth's nearest celestial neighbor, put the finishing touches on one of the world's greatest engineering marvels, made major contributions to life on Earth, and turned its sights toward the next era of exploration. "This year, NASA's work made headlines around the world," NASA Administrator Charles Bolden said. "More importantly, it enlarged our understanding of the universe and our home planet, inspired people, and opened new frontiers for our dreams and aspirations." By Keith Cowing on December 20, 2010 12:57 PM. Keith's note: According to a Tweet by @KevinDJones, a NASA MSFC-associated social networking consultant, "Recording videos for NASA's soon-to-be ExplorNet. I love this!" I'll be willing to bet that most of NASA knows nothing about "NASA's soon-to-be ExplorNet". Expect some confusion, though: the name is already is use elsewhere. But this domain is for sale. By Keith Cowing on December 19, 2010 7:26 PM. "Now that we have a six-person crew, we're going to try to average 30 hours a week on various types of science," station commander Scott Kelly said in an interview conducted before the Soyuz launch. "Hopefully we'll have great results from the scientific experiments that we're able to do onboard." Keith's note: The six-person ISS crew takes one day off a week. If you assume 6 work days for 6 crew at 8 hours a day you get 288 work hours from the crew every week. 30 hours represents 10.4% of the overall crew work time devoted to "science". If you were to assume that the crew "works" 12 hours a day (432 work hours a week for the entire crew), then the percentage of their time devoted to "science" is 6.9%. The avowed purpose of the ISS as NASA SOMD's Mark Uhran and others will tell you is to do "science". Up until now the task facing NASA was to assemble the ISS - not an insignificant endeavour - however you look at it. Well, the ISS is all but completed. When will NASA actually start to honor the premise upon which the ISS has been marketed and justified for more than 20 years, i.e. to do "science"? The ISS is an utterly amazing and unprecedented base camp sitting at the cusp of the human exploration (and exploitation) of the solar system. Right now, based on time spent by the crew, the primary purpose of the ISS is not "science" - it is operations i.e. keeping itself going. Its time for NASA to adjust its marketing to reflect that reality - unless, that is, it is ready to truly open this facility up to the world outside of NASA to utilize. So far, it has fallen flat on its face in that regard. Keith's update: NASA used to announce the name of the crew member whose job aboard the ISS was "Chief Science Officer" Unless I have missed something, this has not been announced in quite some time (Thanks to Jim Muncy for pointing this out). By Keith Cowing on December 18, 2010 10:01 AM. "Leading House climate skeptic Jim Sensenbrenner appears to have landed a perch to lead investigations into global warming science. The Wisconsin Republican is set to become the vice chairman of the House Science Committee under incoming Chairman Ralph Hall (R-Texas), Hall told POLITICO Thursday. "With his background, his insistence, he can do the mean things that we don't want to do," Hall said. "I'm a peaceful guy; he likes combat." "Two Texas lawmakers will take the reins of the House Science and Technology Committee next year. Rep. Ralph Hall (R-Texas) will chair the committee, and Rep. Eddie Bernice Johnson (D-Texas) will be the ranking Democrat." By Keith Cowing on December 18, 2010 10:00 AM. "The U.S. House of Representatives approved a short-term spending measure to continue funding the federal government at 2010 levels through Dec. 21. If approved by the U.S. Senate, the measure will give lawmakers in that chamber time to complete work on a longer-term spending package for the fiscal year that began Oct. 1." By Keith Cowing on December 18, 2010 7:23 AM. Dream Chaser Model Drops in at NASA Dryden "NASA Dryden supported helicopter air-drop flight tests of a 5-foot-long, 15-percent scale model of the Sierra Nevada Corporation's (SNC) Dream Chaser spacecraft design under a Space Act Agreement between the two organizations. The company's planned full-size Dream Chaser vehicle, based on the NASA HL-20 lifting body, is designed to carry up to seven people to the International Space Station and back. The vehicle is slated to launch vertically on an Atlas V rocket and land horizontally on conventional runways." Where Are Mark Uhran's Five ISS Research Results Papers? By Keith Cowing on December 17, 2010 9:33 AM. Keith's note: NASA held a ISS National Lab Public Day CAN meeting on 10 December 2010. The purpose was to explain the pending Cooperative Agreement Notice and how interested parties should structure their proposals. The main speaker was NASA's Mark Uhran, Assistant Associate Administrator for ISS at NASA SOMD. At one point Uhran bragged that he had "written 5 papers" on discoveries that had been made on the ISS, but he said that he was not going to tell anyone where to find them - thus challenging the attendees to go dig these papers up themselves. That is certainly an odd stance for a NASA official to take - especially one who is charged with promoting the value of the ISS as a platform for scientific research. So I thought I'd try and find these pivotal five papers Uhran referred to. Continue reading Where Are Mark Uhran's Five ISS Research Results Papers?. By Keith Cowing on December 16, 2010 5:20 PM. "Problems reportedly bedeviled a communication link leading to Russia's Mission Control for a few hours today -- leading to false alarms suggesting that there was trouble on the International Space Station, or on a Soyuz spacecraft that's on its way to the station. The glitch has been resolved and the crews are in no danger, but the snag caused a stir in press circles. NBC News analyst James Oberg pieced together the story from Russian media reports as well as NASA sources who were keeping tabs on the station and the Soyuz. The alarm was sparked by a Novosti report claiming that Russian controllers were "without communication about the status of the International Space Station" and "haven't received any information about the status of the Soyuz." Keith's note: Hmm ... no mention by SOMD of the comms glitch here in the NASA ISS On-Orbit Status 16 December 2010 - we we do know from this report that "NASA astronauts keep a personalized log of their nutritional intake over time on special MEC software. Recorded are the amounts consumed during the past week of such food items as beverages, cereals, grains, eggs, breads, snacks, sweets, fruit, beans, soup, vegetables, dairy, fish, meat, chicken, sauces & spreads, and vitamins ..."
By Keith Cowing on December 16, 2010 5:07 PM. "NASA named Richard Keegan as the agency's associate deputy administrator on Thursday. He replaces Charles Scales, who has held the position since April 2007. Scales is retiring. The associate deputy administrator assists and supports NASA's administrator and deputy administrator during day-to-day agency operations, across the broad scope of institutional and workforce issues, and with contingency and continuity of operations planning." By Keith Cowing on December 16, 2010 2:23 PM. It is with deep regret and sadness that I announce the unexpected passing of Dr. John Sigwarth, a senior scientist in the Heliophysics Division here at Goddard Space Flight Center. John died Monday of an aortic aneurysm. He was 49. John joined Goddard in 2004 and was an incredibly respected and dedicated member of our community. He received his Ph.D. from The University of Iowa in December 1989 and was a world expert in the physics of the Aurora Borealis. John was the Project Scientist for the POLAR mission and was the Principal Investigator for one of the instruments on the recently launched Fastsat mission. Most recently, John was developing new advanced instrumentation to image the Earth's Thermosphere and leading one of the Center's Explorer proposals. John's spouse, Dr. Nicky Fox, is a Project Scientist for the Radiation Belt Storm Probes mission at the Johns Hopkins University Applied Physics Laboratory and a close friend of many here at Goddard. By Marc Boucher on December 16, 2010 10:47 AM. "On December 8, SpaceX became the first commercial company in history to re-enter a spacecraft from Earth orbit. SpaceX launched its Dragon spacecraft into orbit atop a Falcon 9 rocket at 10:43 AM EST from Launch Complex 40 at the Cape Canaveral Air Force Station in Florida. The Dragon spacecraft orbited the Earth at speeds greater than 7,600 meters per second (17,000 miles per hour), reentered the Earth's atmosphere, and landed just after 2:00 PM EST less than one mile from the center of the targeted landing zone in the Pacific Ocean." Marc's note: This new update from SpaceX includes a few new pictures. By Marc Boucher on December 16, 2010 9:41 AM. "Aerojet, a GenCorp company, announced today that over the next few months it will expand its presence in the Huntsville community by hiring 25 local engineers. This growth will allow Aerojet to provide collaborative engineering expertise, program management support and business development outreach to our government and prime customers located in the Huntsville area and across the Southeastern United States." By Keith Cowing on December 16, 2010 6:18 AM. "Planet Hunters, which is the latest in the Zooniverse citizen science project collection, will ask users to help analyze data taken by NASA's Kepler mission. The space telescope has been searching for planets beyond our own solar system -- called exoplanets -- since its launch in March 2009." By Keith Cowing on December 15, 2010 9:13 PM. "NASA's Mars Odyssey, which launched in 2001, will break the record Wednesday for longest-serving spacecraft at the Red Planet. The probe begins its 3,340th day in Martian orbit at 5:55 p.m. PST (8:55 p.m. PST) on Wednesday to break the record set by NASA's Mars Global Surveyor, which orbited Mars from 1997 to 2006." "A Lockheed Martin-built spacecraft, NASA's Mars Odyssey orbiter has worked longer at Mars than any other spacecraft in history." By Keith Cowing on December 15, 2010 5:29 PM. "With another solid financial performance in 2010, the aerospace industry has again demonstrated its vital importance to the U.S. economy. "Aerospace has produced solid results, including a new sales record for the seventh straight year, leading all manufacturers in trade surplus and providing a sense of stability amidst the chaos of economic upheaval," said AIA President and CEO Marion C. Blakey. In her remarks to more than 300 members of the news media, government and industry at the association's 46th annual Year-end Review and Forecast Luncheon, Blakey cited a preliminary total aerospace sales figure of $216.5 billion." By Keith Cowing on December 15, 2010 5:24 PM. "The Commercial Spaceflight Federation, representing 37 companies employing thousands of Americans nationwide, has selected its next Chairman of the Board, Eric C. Anderson, who holds the position of chairman of Space Adventures, Ltd. Anderson was elected by a diverse cross-section of industry leaders at a recent board meeting. Anderson succeeds Mark Sirangelo of Sierra Nevada Space Systems, who has completed his appointed term as Federation Chairman. Mr. Sirangelo will continue on as an officer and board member of the Federation as Chairman Emeritus." By Keith Cowing on December 15, 2010 5:23 PM. Keith's note: NASA held a ISS National Lab Public Day CAN meeting on 10 December 2010. The purpose was to explain the pending Cooperative Agreement Notice and how interested parties should structure their proposals. The main speaker was NASA's Mark Uhran. It is quite clear that while NASA is going through the motions of trying to expand the user base for its portion of the International Space Station, that it is still falling back on bad habits i.e. limiting how much of these resources anyone other than NASA will ever be able to tap. More than once, Uhran stated rather emphatically that any group looking to run the ISS National Laboratory organization who proposed to conduct human life science would find their proposal deemed "non-responsive". Alas, Uhran has yet to provide the formal justification for this stance - one based on law and advisory committee recommendations. Indeed, at one point Uhran bragged that he had written 5 papers on discoveries that had been made on the ISS, but he was not going to tell anyone where to find them - challenging the attendees to go dig these papers up themselves. That is certainly an odd stance for a NASA official to take - especially one who is charged with promoting the value of the ISS as a platform for scientific research. Continue reading NASA: It's Our Space Station - Not Yours. By Keith Cowing on December 15, 2010 3:27 PM. "Hall is steeped in the legislative battles around those issues. But in a caucus full of self-styled reformers, he remains a type of throwback legislator - a guardian of home-state interests and federal programs, including NASA. "I'm satisfied with what I have," said Hall, 87, adding that he pondered running for chairman of a more prominent panel, House Energy and Commerce. "It's a good Texas launching pad to do things for Johnson Space Center." "Our Committee will help ensure that taxpayer dollars are invested wisely in research and development programs by providing effective oversight of existing programs and by eliminating wasteful and duplicative programs and streamlining programs where needed. Republicans have been given the opportunity to help make our government function more efficiently and effectively, and we will work to achieve fiscal responsibility." By Marc Boucher on December 15, 2010 2:15 PM. By Keith Cowing on December 14, 2010 6:04 PM. "Boeing is proposing an approach that will significantly mature the CST-100 design through demonstrations of critical subsystems. The CST-100 spacecraft is designed to support NASA's primary objective of affordable access to Low Earth Orbit. It will carry up to seven crew and passengers, is reusable up to 10 times, and is compatible with a variety of expendable launch vehicles. The spacecraft -- which is comprised of a Crew Module and a Service Module -- draws on Apollo-proven aerodynamic characteristics in a design that uses commercial, off-the-shelf, cost-effective technologies." By Keith Cowing on December 14, 2010 12:37 PM. "The National Aeronautics and Space Administration (NASA) Office of Education invites proposals for the NASA Ralph Steckler/Space Grant Space Colonization Research and Technology Development Opportunity (hereafter "Steckler/Space Grant Opportunity"). Proposals may only be submitted by the 18 Phase 1 awardees. Each funded proposal is expected to address innovative, meaningful, and enduring research and technology development activities that could enable space colonization." Keith's note: The opening text of the CAN agreement says that the release date for this solicitation was 11 November 2010 - and that the Notice of Intent letters were due on 30 November 2010. Yet the first time anything is formally posted on NASA's procurement site is 13 December 2010. Proposals are due in a month (12 January 2011) and there are two major holidays in between. What a nice way for JSC to make certain that no one - especially students and faculty preparing for exams and away on vacation - have much time to prepare anything for submittal. The notice says "for informational uses only". What is the point of posting information that is already out of date? Why not post it when it has some value i.e. 11 November 2010 - not 13 December 2010? Did it ever ocur to anyone that there might be interested parties or indiviuals out there who might approach one or more of the initial 18 selectees to offer assistance? By Keith Cowing on December 14, 2010 11:42 AM. "Every year in February, the President submits his budget request for the federal government to Congress. This year, along with the President's budget request for NASA, we will be submitting our new NASA Strategic Plan, which guides the work we will perform. The NASA Strategic Plan outlines our long-term goals as an agency and describes how we will accomplish those goals through the outcomes that support each goal over the next decade or more. Our Strategic Plan team has been hard at work and we now have a solid new mission statement, vision, and strategic goals and outcomes, all of which will form the basis for the new Strategic Plan. I shared these with you back in October, but wanted to take this opportunity to talk about them in more detail." By Keith Cowing on December 14, 2010 9:36 AM. "The Phantom Ray UAV got some air time today, with a little help from a jumbo jet. Boeing's futuristic unmanned aerial vehicle took a 50-minute flight today riding piggyback on a NASA Shuttle Carrier Aircraft, a modified 747 designed to ferry space shuttles from one terrestrial site to another. The aerospace giant had said earlier in the year that the Phantom Ray was on track to make its first flight, but this may not be exactly what it had in mind." By Marc Boucher on December 14, 2010 9:34 AM. "Shuttle managers also decided late Monday afternoon that following the tanking test they plan to roll Discovery back into Kennedy's Vehicle Assembly Building (VAB) to allow its external tank to undergo additional image scans. Rollback is expected to occur 4-5 days after the tanking test. Once in the VAB, technicians would collect X-ray data on stringers on the back side of the external tank midsection, called the intertank, which is not accessible at the launch pad. Additionally, the test instrumentation and foam insulation on those areas of the intertank would be removed and the area would be prepared again for launch. In parallel, the back side stringer inspections would take." By Marc Boucher on December 14, 2010 8:38 AM. "Orbital Sciences Corporation today announced that it has submitted a proposal to the National Aeronautics and Space Administration (NASA) in response to the Commercial Crew Development-2 contract solicitation. The company also provided several top-level details of its proposal for providing safe and affordable transportation services to and from the International Space Station (ISS) and for commercial activities in Earth orbit." "According to industry sources, Orbital Sciences plans to team with Virgin Galactic of New Mexico to market commercial rides on the planned spacecraft and conduct drop tests of the orbital space vehicle using Virgin's WhiteKnightTwo carrier aircraft. Virgin Galactic, however, is not mentioned in Orbital's Dec. 14 press release, which lists only the "major suppliers" that will "contribute major elements of the system." By Keith Cowing on December 13, 2010 8:35 PM. "The 33-year odyssey of NASA's Voyager 1 spacecraft has reached a distant point at the edge of our solar system where there is no outward motion of solar wind. Now hurtling toward interstellar space some 10.8 billion miles from the sun, Voyager 1 has crossed into an area where the velocity of the hot ionized gas, or plasma, emanating directly outward from the sun has slowed to zero. Scientists suspect the solar wind has been turned sideways by the pressure from the interstellar wind in the region between stars." By Keith Cowing on December 13, 2010 11:04 AM. "NASA Administrator Charles Bolden has named Waleed Abdalati the agency's chief scientist, effective Jan. 3. Abdalati will serve as the principal adviser to the NASA administrator on agency science programs, strategic planning and the evaluation of related investments. Abdalati will represent all of the scientific endeavors in the agency, ensuring they are aligned with and fulfill the administration's science objectives. He will advocate for NASA science in the context of those broader government science agendas and work closely with the White House Office of Science and Technology Policy and the Office of Management and Budget." By Keith Cowing on December 13, 2010 7:26 AM. Summary of the ISS National Laboratory CAN (not so) "Public Day"
"NASA held a "public day" for the recently-released Cooperative Agreement Notice (CAN) for the ISS National Lab Management Entity at NASA Headquarters today. Didn't now about it? You're not alone. In summary: Its the same wonderfully capable, yet under-utilized space station burdened with the same flawed and closed thinking that NASA never seems to be willing - or able - to escape." By Keith Cowing on December 13, 2010 7:25 AM. "Once a non-profit organization is established, NASA expects to begin research and development, but it will take a few years before the enterprise is running at full throttle, says Uhran." According to PUBLIC LAW 111-267--OCT. 11, 2010 124 STAT. 2827 - SEC. 504. MANAGEMENT OF THE ISS NATIONAL LABORATORY - (d) RESEARCH CAPACITY ALLOCATION AND INTEGRATION OF RESEARCH PAYLOADS. "(1) ALLOCATION OF ISS RESEARCH CAPACITY. As soon as practicable after the date of the enactment of this Act, but not later than October 1, 2011, ISS national laboratory managed experiments shall be guaranteed access to, and utilization of, not less than 50 percent of the United States research capacity allocation, including power, cold stowage, and requisite crew time onboard the ISS through September 30, 2020. Access to the ISS research capacity includes provision for the adequate upmass and downmass capabilities to utilize the ISS research capacity, as available. The Administrator may allocate additional capacity to the ISS national laboratory should such capacity be in excess of NASA research requirements." Keith's note: At the ISS National Lab Public Day CAN meeting yesterday, Mark Uhran said that NASA hopes to award the contract to this non-profit organization in May 2011. That means that the new ISS National Lab organization has to hit the ground running and be meeting these requirements 5 months (or less) later. However, Uhran states in Nature that it is going to take "a few years" for everything to be "running at full throttle". Clearly NASA is nowhere near being able to carry out the provisions stated in Public Law 111-26 in terms of the required date - nor does it intend to, if Uhran's statements are to be accepted as being indicative of NASA's intent. With the halting of shuttle operations in mid-2011, it is also unclear how NASA will be able to meet all the downmass and upmass requirements by October 1, 2011. By Keith Cowing on December 13, 2010 7:03 AM. "John M. Logsdon, a space policy expert at George Washington University, said Hall's committee also will have to monitor NASA's progress on a deep-space rocket and crew capsule that must be built by 2016. "I can say with a fair degree of assurance that NASA is finding it technically and financially difficult to meet some of the targets in the authorization bill," Logsdon said. "I would expect him to raise some of the questions to NASA about how they are planning on going forward," he said." By Keith Cowing on December 11, 2010 1:48 PM. "The following statement was issued by NASA on 12/8 regarding a review of NASA's human spaceflight research. In light of this review, NASA has informed Brookhaven that a proposal involving primate research at the NASA Space Radiation Laboratory on the Brookhaven Lab site should be removed from consideration for experimental time at the facility." "NASA is going to undertake a comprehensive review of the agency's current research and technology development plans to see how they align with the President's plan for human spaceflight, as outlined in the U.S. National Space Policy and the 2010 NASA Authorization Act. We look forward to the findings of that review, which will inform our decision making moving forward." "... the space agency has quietly called off plans to conduct cruel radiation experiments on monkeys. Keith's 9 Dec note: Contrary to PeTA's claims, NASA has not "called off these exeriments". They may well do so in the future after they conduct this review, but as of today they have not done so yet. Nothing has been cancelled - yet. By Marc Boucher on December 10, 2010 3:03 PM. "Technicians will work this weekend to prepare space shuttle Discovery's external tank for a tanking test planned for no earlier than Wednesday. Because the test hopes to glean a great deal of information, technicians will place 89 instruments including strain gauges to the tank to precisely record movement and temperatures from the tank's ribbed intertank area as it chills and warms again during the fuel loading and emptying process. The tank holds super-cold liquid oxygen at minus-297 degrees and liquid hydrogen at minus-423 degrees. The cryogenic propellants cause the tank to shrink by about half an inch." By Marc Boucher on December 10, 2010 2:54 PM. "A veteran of two spaceflights, Poindexter logged more than 669 hours in space. In 2008, he was the pilot on the STS-122 space shuttle mission to deliver and install the European Space Agency's Columbus laboratory to the International Space Station. In 2010, he was the commander for STS-131, a resupply mission to the station that delivered more than 13,000 pounds of hardware and equipment." By Keith Cowing on December 10, 2010 8:49 AM. "The National Aeronautics and Space Administration (NASA) Space Operations Mission Directorate is releasing a draft version of the future Cooperative Agreement Notice for the ISS National Laboratory Management Entity." "The Public Day will be held on Friday, December 10, 2010, from 9:00 a.m. - 1:00 p.m. at the NASA Headquarters James Webb Auditorium. ... Only parties that have registered will be permitted to attend. No walk-in participants will be accepted." Keith's 10 Dec update: Contrary to the official Federal Register note regarding this meeting, "walk-in participants" are most certainly being allowed into this meeting. Indeed, no one is being asked to provide proof of registration at all. You can just walk into the Webb Auditorium with no questions asked. This nonsense is typical of NASA - they say one thing and then ignore it. Net result: people who might otherwise have attended did not. There are cameras in the room but no indication that this will be webcast or broadcast. Keith's 9 Dec note: According to NASA TV's posted schedule this "public" meeting will not be aired on NASA TV - live or otherwise. Given the short notice people were given to register and the preregistered-only admission policy, the number of people who will have a chance to actually understand what NASA wants to do with the ISS is going to be very small. I can certainly understand limits on physical attendence due seating limitations, but if NASA really wants to use the ISS - as a "national labratory" - one would think that they'd at least go out of their way to make this "public" meeting available on NASA TV i.e. "public". Keith's 10 Dec update: I am going to try and post Twitter updates from the meeting here - assuming I can get a WiFi signal. By Keith Cowing on December 9, 2010 9:10 PM. "Congressional burnouts such as Bill Nelson keep telling us that we are losing our space program to budget cuts. SpaceX is demonstrating that we can afford a space program, but only if we get NASA and its army of Washington pork groupies out of the way. The most amazing thing happened before Wednesday's launch. Engineers found cracks in the nozzle of the upper-stage engine. Living with the shuttle, we are accustomed to such anomalies resulting in launch delays that can go on for weeks and cost millions. Instead, SpaceX engineers whipped out their metal snips and trimmed off the edge of the nozzle where the cracks were situated. It was the proverbial duct-tape fix of the Mercury era." By Keith Cowing on December 9, 2010 5:18 PM. "As NASA's space shuttle fleet nears retirement, the agency is preparing to release a comprehensive account of the program that managed the spacecraft and the dedicated people who made its accomplishments possible. 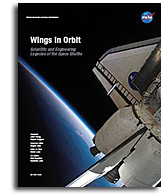 The 500-plus-page book, "Wings in Orbit" is available for pre-publication sale. The book describes the scientific, engineering and cultural contributions of the space shuttle through text, photographs and graphics, written or selected by those who worked in the shuttle program. The book is slated for release in March. To order the book during the pre-publication sale through Dec. 31, visit: http://www.shopNASA.com"
Keith's 9 Dec note: FYI shopNASA.com is the JSC Gift shop. No mention is made of that in this press release/advertisement. The cost of the book is $50 for soft cover and $90 for hardcover - and this is a government publication prepared by government employees, promoted by the government. I can't say for certain from the cover image I found but it sure looks like this has an official NASA "SP" number on it. I have asked NASA: Does the JSC Exchange have an exclusive on the sale of this government book? Will copies be provided to taxpayers? If hard copies are being printed at government expense who are they being distributed to? Can you send me a PDF of the book? Can I get the original publication art such that I can republish this book? NASA issued this solicitation in July 2010 but they are not complying with what they are supposed to be doing i.e. providing PDF versions etc. on a website or allowing others to have access to this copyright free, government-produced material. There is no mention of sole sourcing but that is exactly what they are doing - and they are providing free government advertising for that one publisher. One would think that if NASA really wanted people to read this book that they'd find a way to offer it on Amazon.com, iBooks, etc. and not sole source it to a field center gift shop. Imagine zillions of copies on Kindle and iPads for the holidays ... yet another example that NASA simply does not understand marketing its brand. Continue reading The NASA Shuttle Book No One Will Ever See (Updated). By Keith Cowing on December 9, 2010 3:20 PM. "Before the successful launch, voyage, and recovery of SpaceX's Dragon Spacecraft, the first time in history a commercial company has recovered a spacecraft from orbit, reporters were buzzing with news of a "secret" payload, stowed on board." By Keith Cowing on December 9, 2010 8:52 AM. "CR's typically extend an agency's existing budget for a certain period of time, but the version passed yesterday by the House is different. While the total amount of funding in the bill, $1.09 trillion, is the same as the current level according to Politico, NASA's budget, for example, would rise from its FY2010 level, though is still less than the request. The CR also spells out in some detail how NASA is to spend the money, not unlike a traditional appropriations measure." "North Alabama's two Republican congressmen, Rep. Parker Griffith of Huntsville and Rep. Robert Aderholt of Haleyville, voted against the bill despite its boost for NASA." "SEC. 2206. Notwithstanding section 1101, the level for the following accounts of the National Aeronautics and Space Administration shall be as follows: ..."
By Keith Cowing on December 8, 2010 8:34 PM. By Keith Cowing on December 8, 2010 3:53 PM. "I congratulate SpaceX on its successful launch of the Falcon 9 Rocket and Dragon capsule," said Senator Hutchison. "This launch represents an important milestone that reflects the wisdom of the balanced approach outlined in the recently enacted NASA authorization law. The new law preserves and advances the activities of commercial space companies working to develop reliable cargo and crew services to the International Space Station." "This is the first in a new generation of commercial launch systems that will help provide vital support to the International Space Station and may one day carry astronauts into orbit. This successful demonstration flight is an important milestone in meeting the objectives outlined by President Obama and Congress, and shows how government and industry can leverage expertise and resources to foster a new and vibrant space economy." "Space industry leaders, astronauts, and the Commercial Spaceflight Federation are issuing the following statements following the successful launch, orbital operation, and splashdown of the Dragon capsule, a milestone in commercial spaceflight ..."
By Keith Cowing on December 8, 2010 2:58 PM. CAPE CANAVERAL, Fla. -- The first demonstration flight of SpaceX's Falcon 9 rocket and Dragon capsule for NASA's Commercial Orbital Transportation Services program has been scheduled for Wednesday, Dec. 8, from Cape Canaveral Air Force Station in Florida. The launch window extends from 9 a.m. to 12:22 p.m. EST. ...."
By Keith Cowing on December 8, 2010 2:13 PM. "Today SpaceX released the following information on today's launch day activities for the first SpaceX Falcon 9/Dragon demonstration launch for NASA's Commercial Orbital Transportation Services (COTS) program. SpaceX will make its first launch attempt on TODAY, December 8th from Launch Complex 40 at Cape Canaveral Air Force Station in Florida. The launch window extends from 9:03 AM to 12:20 PM. EST/ 6:03 AM to 9:20 AM PST. We are now counting down for a 9:06 AM EST attempt." Keith's note: Terminal count aborted at T-2:50. Next launch window is 10:38 - 10:43 am EST. There are two more launch opportunities today - 10:38 - 10:43 am EST and 12:16 -12:20 pm EST. Keith's note: Launch and ascent nominal this far 264 km alt 4,300 m/sec. Second stage burning nominally. Perfect power systems, telemetry lock confirmed. Keith's note: Dragon is in orbit. Dragon deploy verified. Keith's 1:23 pm EST update: Dragon's deorbit burn is complete. Keith's 1:55 pm EST update: Three main chutes deployed. Keith's note: NASA Watch Twitter updates can be found here. By Keith Cowing on December 8, 2010 8:15 AM. "The probe, called Akatsuki, which means dawn, reached Venus on Tuesday and fired its engines in an attempt to reach an elliptical orbit. But mission officials said they briefly lost contact after that and determined Wednesday that Akatsuki's engines did not fire long enough to attain the proper orbiting position.... "Unfortunately, it did not attain an orbit," said JAXA's Hitoshi Soeno. "But it appears to be functioning and we may be able to try again when it passes by Venus six years from now." By Keith Cowing on December 7, 2010 6:56 PM. "The draft resolution also includes $1.2 billion for Lockheed Martin's Orion crew capsule, $100 million more than called for in the Senate appropriations measure and the new authorization act. The draft language also includes a passage that would allow NASA to cancel the Ares family of rockets Obama targeted for termination in his 2011 spending proposal and to initiate new programs, a key hurdle the agency has sought to overcome since the start of the 2011 budget year Oct. 1. Another $1.8 billion would fund NASA's space shuttle orbiters in 2011, including $825 million for "additional Space Shuttle costs." "The news isn't all good for Florida, however. Congressional appropriators want NASA to cut more than $200 million, or about half the money that had been earmarked to begin modernizing the badly outdated launch facilities at KSC next year." Continue reading Snarky NASA SMD Response to Snarky Public Astrobiology Discussion. By Keith Cowing on December 7, 2010 5:28 PM. "It has been said that a ship is safe in harbor, but a harbor is not where ships belong. If SpaceX doesn't fully succeed in its first try with Dragon, there will be disappointment, and some may even question NASA's wisdom in undertaking the COTS program. Others may question the ability of the American aerospace industry to undertake such a complex task as ISS cargo resupply. Still others may once again beat the anti-space commercialization drum." By Keith Cowing on December 7, 2010 5:05 PM. "ESA is looking for new ways to conduct interesting research in space, on Earth - and in between. A number of commercial suborbital vehicles are being considered in Europe, and ESA is looking at the possibilities they might offer for microgravity research. If you think you could help, then we would be pleased to hear from you." By Keith Cowing on December 7, 2010 5:02 PM. "NASA Deputy Administrator Lori Garver joined U.N. Secretary General Ban Ki-moon to deliver introductory remarks at the RHoK event in New York. Google Vice President of Research Alfred Spector and RHoK co-founder Patrick Svenburg, director of government platform strategy at Microsoft, also attended. "The RHoK hackathons provide a forum for innovators to come up with real-world solutions that can make a huge difference in people's lives," Garver said. "NASA's commitment to building on its data and opening it up to other users allows us to expand the tools available for disaster response." By Keith Cowing on December 7, 2010 3:27 PM. "NASA's Science Mission Directorate solicits nominations of individuals who would serve on one of the following advisory subcommittees of the NASA Advisory Council (NAC) .. Either self nominations or nominations of others are acceptable. The membership term will be for two to three years. Members will be required to attend meetings two to four times a year, either in person or via telecon/WebEx. .. Nominators should submit a vita and a one-page statement on their reasons for supporting a specific nominee (or themselves in the case of self-nominated individuals) to serve on the subcommittee." By Keith Cowing on December 7, 2010 2:40 PM. "Gregory D. Blaney has been named director of NASA's Independent Verification and Validation, or IV&V, Program in Fairmont. The IV&V program provides software verification and validation services, as well as software safety assurance support for the agency's most critical missions. NASA's Goddard Space Flight Center in Greenbelt, Md., oversees the West Virginia facility." By Keith Cowing on December 7, 2010 10:13 AM. By Keith Cowing on December 6, 2010 7:41 PM. "The Coalition for Space Exploration (Coalition) today announced veteran aerospace communicators Glenn Mahone of Aerojet and Lon Rains of Northrop Grumman will lead the Coalition's Public Affairs Team in 2011. Mahone and Rains will serve as the new chair and deputy chair, respectively. Each will serve a one-year term, effective January through December 2011." By Keith Cowing on December 6, 2010 1:43 PM. Keith's note: Due to some issues with the nozzle on the second stage engine SpaceX has delayed the Falcon 9/Dragon launch until Thursday at the earliest. If they have to replace anything the launch will be Saturday at the earliest. By Keith Cowing on December 6, 2010 11:50 AM. "The Terrestar-1 satellite, launched in 2008, is as big as a school bus, connects to a tiny handset called the Genus, and proves that communication satellites can provide data services effectively. The company that owns that satellite filed for chapter-11 bankruptcy protection on October 19th 2010. We believe that Internet access is a tool that allows people to help themselves - a tool so vital that it should be considered a universal human right. Imagine your digital life disconnected." By Keith Cowing on December 6, 2010 10:54 AM. Keith's note: Here's the premise: Random Hacks of Kindness (RHoK) - a series of long workshops (often known as "Hackathons") are held in multiple locations around the world wherein people come together to share their skills and create things (software etc.) that can be of use to others locally and globally. Wonderful idea. NASA becomes involved - thus offering the potential to bring its resources to bear - and ingest ideas from external and novel resources. Doubly wonderful - I can smell the synergy. Add in NASA's Deputy Administrator, the Secretary General of the United Nations at the opening session and there's an emergent property - one of heightened visibility for the concept and the participants. I'm sold. Marvelous concept. Gimme more. NASA sends representatives from the Chief Technologist's and Chief Information Officer's organizations. What are they doing? Well, that's uncertain. NASA civil servant participants Robbie Schingler (NASA HQ CTO Chief of Staff) and Nick Skytland (NASA HQ CIO office) and perhaps others are big fans of social media tools yet they did little to use these tools other than to retweet several generic items about the event as a whole. They made no mention of what they - or NASA - were actually doing at this event. Were they coding? Organizing? What? So much for being "open and transparent". This is especially ironic given that Schingler and Skytland work on NASA's Open Gov efforts, often serving as agency evangelists in this regard. Continue reading Continued Closed Openness At NASA. By Keith Cowing on December 6, 2010 10:32 AM. "The National Aeronautics and Space Administration (NASA) is soliciting proposals for competitive evaluation and award of a Cooperative Agreement to a non-profit entity to develop the capability to implement research and development projects utilizing the International Space Station (ISS) National Laboratory and to otherwise manage the activities of the ISS National Lab." By Keith Cowing on December 6, 2010 6:15 AM. "This notice of waiver concerns two petitions for waiver submitted to the FAA by Space Exploration Technologies Corp. (SpaceX): A petition to waive the requirement that a waiver petition be submitted at least sixty days before the proposed effective date; and a petition to waive the restriction that the combined risk to the public from the launch and reentry of a reentry vehicle not exceed an expected average number of 0.00003 casualties ( Ec ≤ 30 x 10-6) from debris. The first petition is unnecessary because, as explained below, SpaceX demonstrated good cause for its late filing. The FAA grants the second petition and waives the restriction that the combined risk to the public from the launch and reentry of a reentry vehicle not exceed an expected average number of 0.00003 casualties ( Ec ≤ 30 x 10-6) from debris." By Keith Cowing on December 4, 2010 9:53 PM. "Today SpaceX released the following information on launch day activities for the first SpaceX Falcon 9/Dragon demonstration launch for NASA's Commercial Orbital Transportation Services (COTS) program. Liftoff could occur as early as December 7th, with December 8th and 9th as backup days, from Launch Complex 40 at Cape Canaveral Air Force Station in Florida. The launch window for all three days extends from 9:00 a.m. to 12:22 p.m. EST." By Keith Cowing on December 4, 2010 3:33 PM. "President Barack Obama announced his intent to nominate the following individuals to key Administration posts: Kathryn D. Sullivan, PhD, Assistant Secretary of Commerce (Observation and Prediction), Department of Commerce." ... President Obama said, "I am pleased that these dedicated and accomplished individuals will be joining our Administration. I am confident they will serve our nation well in their new roles, and I look forward to working with them in the months and years ahead." By Keith Cowing on December 4, 2010 7:42 AM. "At the behest of the White House, the nation's top science advisors this month began a 10-month study of the appropriate "role and size" of the astronaut corps after the final shuttle mission next year. The study, by the National Academies, reflects two realities: NASA's budget, squeezed by congressional budget hawks and its own cost overruns, needs every penny. More significantly, the United States may not need all these astronauts." 1. How should the role and size of the activities which are managed by the human spaceflight crew office change following Space Shuttle retirement and completion of the assembly of the International Space Station (ISS)? 2. What are the requirements of crew-related ground facilities after the Space Shuttle program ends? 3. Is the astronaut corps' fleet of training aircraft a cost-effective means of preparing astronauts for the requirements of NASA's human space flight program? Are there more cost-effective means of meeting these training requirements?" By Keith Cowing on December 4, 2010 7:41 AM. 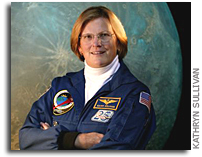 "The objective of the training is to provide a comprehensive look at congressional operations and organizations and an understanding of how Congress affects NASA's policies, priorities and daily operation for NASA HQ members and NASA Leadership and Senior Executive Service Candidate Development Program members. The course shall include: How Congress is Organized and How it Gets It's Work Done Congress and the Political Process Key Stages in the Legislative Process The Budget and Appropriations Processes The Role and Function of Congressional Committees and Committee Staff with special focus on the Subcommittee on Space and Aeronautics, Committee on Science and Technology, U.S. House of Representatives; and the Subcommittee on Space, Aeronautics, and Related Sciences, Committee on Commerce, Science, and Transportation, U.S. Senate The Role and Function of Congressional Personal Staff The Government Accountability Office and NASA OMB's Role in the Legislative Process A Member's (or former Member's) Perspective on NASA's Issues before Congress What Federal Managers Need to Know in Order to Work More Effectively with Congress." By Keith Cowing on December 3, 2010 11:25 PM. "Air Force Space Command Photos: The X-37B sits on the Vandenberg Air Force base runway during post-landing operations Dec. 3. Personnel in SCAPE (Self-contained atmospheric protective ensemble) suits conduct initial checks on the vehicle and ensuring the area is safe." By Keith Cowing on December 3, 2010 5:45 PM. "As part of their suborbital spaceflight training, Southwest Research Institute researchers and suborbital payload specialists Dr. Alan Stern and Dr. Dan Durda have continued their spaceflight training with a new series of jet fighter flights in F-104 aircraft operated by Starfighters Inc. at the Kennedy Space Center, Fla. This new round of SwRI Starfighter flights and ground training took place Nov. 16." By Keith Cowing on December 3, 2010 1:59 PM. "This is a reminder for all employees that classified information, even if posted in the public domain, remains classified and should not be accessed, downloaded, copied, or retransmitted utilizing Government IT resources or equipment. Although information posted to WikiLeaks is in the public domain, the information remains classified. The NASA Headquarters Information Technology and Communications Division (ITCD) has initiated temporary blocks to the WikiLeaks sites. The purpose of the block is to protect NASA's administration network from inadvertently storing spilled "classified" data." By Keith Cowing on December 3, 2010 1:02 PM. "NASA managers have targeted space shuttle Discovery's launch for no earlier than Feb. 3 at 1:34 a.m. EST. Shuttle managers determined more tests and analysis are needed before proceeding with the launch of the STS-133 mission to the International Space Station. The Program Requirements Control Board met Thursday and reviewed engineering evaluations associated with cracks on two 21-foot-long, U-shaped aluminum brackets, called stringers, on the shuttle's external tank. NASA repaired the cracks and reapplied foam to the exterior of the stringers." Marc's note: STS-134 would launch in April, tentatively on Friday, April 1 at 3:15 a.m. ET and if STS-135 goes ahead, launch would tentatively be in June. By Keith Cowing on December 3, 2010 8:00 AM. "Flying back to Earth after nearly 225 days in space, the U.S. Air Force's X-37B space plane blazed through the atmosphere over the Pacific Ocean Friday and swooped into a California air base under the cloak of darkness. Capping a secret mission in space, the unmanned spaceship touched down at 0916 GMT (4:16 a.m. EST; 1:16 a.m. PST) on the landing strip at Vandenberg Air Force Base, Calif."
Obama's Space Policy - Good/Bad For NASA? By Keith Cowing on December 2, 2010 6:38 PM. "The charm of Obama's plan is that it seeks to disentangle NASA from these vested interests. NASA will set the price and technical specifications of orbital launches and leave the details to private enterprise. It will be able to spread its eggs among many baskets rather than putting them in one. The plan thus fights the political pressures with the only force that might be more powerful: the profit motive. Space businesses have a strong incentive to buy equipment and hire people for their technical merit rather than because their congressional representative was able to bring home the bacon. That's one reason why Obama's plan met with so much opposition. Still, Congress ended up mostly going along with it--and that will help to let NASA be NASA." By Keith Cowing on December 2, 2010 5:10 PM. "Tensions between U.S. Sen. Bill Nelson and the White House openly erupted Wednesday when the Florida Democrat used a packed Senate hearing to accuse the administration of dragging its feet on a new NASA law that Nelson had a hand in crafting. Nelson said the Senate had received word that NASA and "other parts of the administration" were working to undermine the law -- which aims to replace the retiring space shuttle with a new "heavy lift" rocket and crew capsule -- and instead pursue Obama's earlier plans that focused more on technology development. However, he offered no definitive examples or proof. Still, his insistent questioning of John Holdren, who is Obama's science adviser, finally prompted an exasperated Holdren to declare, "We are going to follow the law. I can't emphasize that enough." "Congressional members from Utah, where Alliant builds the solid rocket motors, have also expressed worries that NASA is looking for a way around the law. Two weeks ago, they met with Maj. Gen. Charles F. Bolden Jr., the NASA administrator, and Lori Garver, the deputy administrator. "We wanted to have some assurance that NASA understood intent of the laws," said Representative Rob Bishop, Republican of Utah. "I don't think we were terribly satisfied." Mr. Bishop called the answers from General Bolden "both vague and inconsistent." "The hearing started with lawmakers voicing complaints that NASA was trying to circumvent or delay complying with some congressionally mandated priorities, including developing new heavy-lift launchers derived from solid-propellant technology used on the retiring fleet of space shuttles. "If it is dragged out and we don't have a design" for the new family of rockets, according to Sen. Kay Bailey Hutchison (R., Texas), "we could lose the whole" effort to stay ahead of other countries in manned exploration of space." "When it comes to funding NASA, lawmakers are lately working down to the wire. The night before the October recess, Congress passed an Authorization Act for the agency, mandating a $19 billion budget for FY2011. But legislators were unable to pass the appropriations bill needed to actually provide the funds, instead relying on a continuing resolution that froze funding at FY2010 levels and prohibited the agency from terminating programs or starting new ones. Congress must now decide how, and for how long, it intends to fund NASA before the continuing resolution expires on 3 December." Weird Arsenic-Eating Microbes Discovered? Yes. Finding E.T.? No. By Marc Boucher on December 2, 2010 4:11 PM. "NASA-funded astrobiology research has changed the fundamental knowledge about what comprises all known life on Earth. Researchers conducting tests in the harsh environment of Mono Lake in California have discovered the first known microorganism on Earth able to thrive and reproduce using the toxic chemical arsenic. The microorganism substitutes arsenic for phosphorus in its cell components." "News of the discovery caused a scientific commotion, including calls to NASA from the White House and Congress asking whether a second line of earthly life has been found." By Keith Cowing on December 2, 2010 3:15 PM. "NASA plans to delay the final launch of space shuttle Discovery at least until February, according to a source. The problem remains the cracks discovered in the shuttle's external fuel tank last month. NASA's Program Requirements Control Board has reviewed repairs and engineering evaluations associated with cracks on two 21-foot-long, U-shaped aluminum brackets, called stringers, on the tank but decided the analysis and tests required to launch Discovery safely are not complete, the source said." By Keith Cowing on December 2, 2010 12:41 PM. "Evidence that the toxic element arsenic can replace the essential nutrient phosphorus in biomolecules of a naturally occurring bacterium expands the scope of the search for life beyond Earth, according to Arizona State University scientists who are part of a NASA-funded research team reporting findings in the Dec. 2 online Science Express." By Keith Cowing on December 2, 2010 11:55 AM. "Organizations and members of the media interested in registering for the forum should send an e-mail to jsc-iss-payloads-helpline@mail.nasa.gov by 4 p.m. on Friday, Dec. 3. Only registered parties may attend; no walk-ins will be permitted." Keith's note: Wow. This press release certainly strikes me as a way to limit attendance rather than encourage it - 28 hours notice from JSC PAO - unless you are a fan of NASA's procurement website which issued a notice about this meeting a month ago. Did NASA issue a press release at the time this was originally announced? I cannot find any evidence that they did. No mention is made on the official NASA ISS page or on SOMD's home page or JSC's home page. By Keith Cowing on December 1, 2010 10:31 PM. "The Academy has developed Masters with Masters as part of its ongoing efforts to create a cohesive community of project management and engineering practitioners across NASA. This series will engage master practitioners in a conversation that yields fresh insights and promotes reflection and open sharing. Special Guest Speakers: General Charles Bolden, NASA Administrator; Johann-Dietrich Woerner, Chairman of the Executive Board, German Aerospace Center (DLR)"
Keith's note: Make certain to RSVP for this rare public appearance by Charlie Bolden. Maybe the media can catch him on his way in/out of the Webb Auditorium - unless, that is, the public is not allowed to attend. By Keith Cowing on December 1, 2010 10:29 PM. "The Kepler project wishes to inform the community that it is moving the next data release date (originally planned for June 2011) forward to 1 February 2011. This data set (Quarter 2) is the first consisting of a complete 3 months of observations. It will contain light curves for approximately 165,000 stars (most of which are late-type Main Sequence stars) brighter than 16th magnitude in the Cygnus & Lyra constellations sampled at a 30-minute cadence. Three subsets of one-month each of [up to 512] stars were sampled at 1 min cadence. The shorter cadence data will be released on the same schedule." By Keith Cowing on December 1, 2010 6:03 PM. Keith's 30 Nov note: As has happened before, NASA puts out advance notice of a provocative major discovery, media advisory and speculation goes into overdrive with titles of articles such as "Has NASA found life near Saturn?" based on a single, speculative blogger post. Calm down folks. According to Alexis Madrial, a senior editor at The Atantic (and used to write for Wired) posting on Twitter "I'm sad to quell some of the @kottke-induced excitement about possible extraterrestrial life. I've seen the Science paper. It's not that." followed by "I'm obviously not the only one. It's available to journalists with access to embargoed EurekAlert content." An article by several of the individuals (Benner, Wolfe-Simon) who will be participating in the telecon can be found below. Is NASA's announcement related to NASA's announcement? Who knows. "Astrobiologists are aware that extraterrestrial life might differ from known life, and considerable thought has been given to possible signatures associated with weird forms of life on other planets. So far, however, very little attention has been paid to the possibility that our own planet might also host communities of weird life. If life arises readily in Earth-like conditions, as many astrobiologists contend, then it may well have formed many times on Earth itself, which raises the question whether one or more shadow biospheres have existed in the past or still exist today. In this paper, we discuss possible signatures of weird life and outline some simple strategies for seeking evidence of a shadow biosphere." Then there is this article by another one of the authors (Wolfe-Simon) dealing with putative life forms that use Arsenic instead of Phosphorus in their biochemistry. Again, the concept of a "shadow biosphere" and thoughts as to whether this can be applied to extraterrestrial locations are discussed. "All known life requires phosphorus (P) in the form of inorganic phosphate (PO43- or Pi) and phosphate-containing organic molecules. Piserves as the backbone of the nucleic acids that constitute genetic material and as the major repository of chemical energy for metabolism in polyphosphate bonds. Arsenic (As) lies directly below P on the periodic table and so the two elements share many chemical properties, although their chemistries are sufficiently dissimilar that As cannot directly replace P in modern biochemistry. Arsenic is toxic because As and P are similar enough that organisms attempt this substitution. We hypothesize that ancient biochemical systems, analogous to but distinct from those known today, could have utilized arsenate in the equivalent biological role as phosphate. Organisms utilizing such 'weird life' biochemical pathways may have supported a 'shadow biosphere' at the time of the origin and early evolution of life on Earth or on other planets. Such organisms may even persist on Earth today, undetected, in unusual niches." Are these articles related to NASA's announcement? Reliable sources within the Astrobiology community tell me that the announcement does indeed concern Arsenic-based biochemistry and the implications for the origin of life on Earth, how it may have happened more than once on our planet, and the implications for life arising elsewhere in the universe. "Posts at MSNBC.com's Cosmic Log blog, Discover's Bad Astronomy blog, and at the independent NASA Watch blog also tried to quell the otherworldly hysteria. (Further efforts have since appeared at the Associated Press and Time.) ... "This shows how important an experienced, trained and authoritative science journalism staff of reporters and editors is," AP science reporter Seth Borenstein wrote in an e-mail, responding to questions about the blog frenzy. "While the blogosphere has the luxury of speculating, The Associated Press seeks to be the definitive source through careful reporting and knowledge of the subject area." By Keith Cowing on December 1, 2010 9:47 AM. "Senate Committee on Commerce, Science, and Transportation announces the following full committee hearing titled Transition and Implementation: The NASA Authorization Act of 2010. Please note this hearing was originally scheduled for Thursday, November 18, 2010 at 10:30 am EST. Witnesses: John P. Holdren, Director, Office of Science and Technology Policy; Elizabeth Robinson Chief Financial Officer, NASA; Cristina Chaplain, Director, Acquisition and Sourcing Management, U.S. Government Accountability Office (Accompanied by: Susan A. Poling, Managing Associate General Counsel U.S. Government Accountability Office)"
Keith's note: You should be able to find a live webcast link here just before the hearing begins. Click on the NASA hearing link. By Keith Cowing on December 1, 2010 7:58 AM. "With this fiscal environment in mind, [general manager of Lockheed Martin's human space flight division] John Karas argues that Orion is the only NASA project far enough along to fly -- and may be the only way to keep the agency's space-faring ambitions alive. "The reason we decided not to wait for a rocket any more is because we'd be sitting on the ground until 2020 which means we would atrophy ...," he said." "I hate to see different entities try to cannibalize the process," said U.S. Rep. Rob Bishop, R- Utah, a staunch supporter of his state's solid-rocket industry. "There is money to move forward on [a heavy-lift rocket using solid-rocket motors], as well as the capsule, as long as NASA budgets its money wisely and doesn't waste it on wild goose chases."